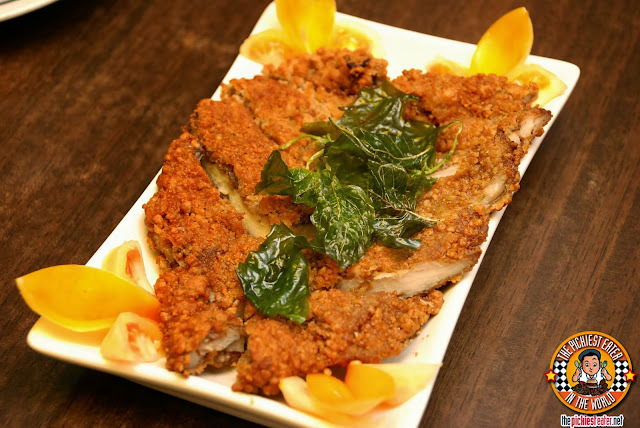 THE PICKIEST EATER IN THE WORLD: SHIFU MASTER'S KITCHEN : GREAT FOOD AT A GREAT PRICE! Richie and I love finding hole in the wall places to eat - with the only requirement it being that its clean. Shifu Master Kitchen's interiors won't dazzle you with its design or decors, but that's not what they're about. 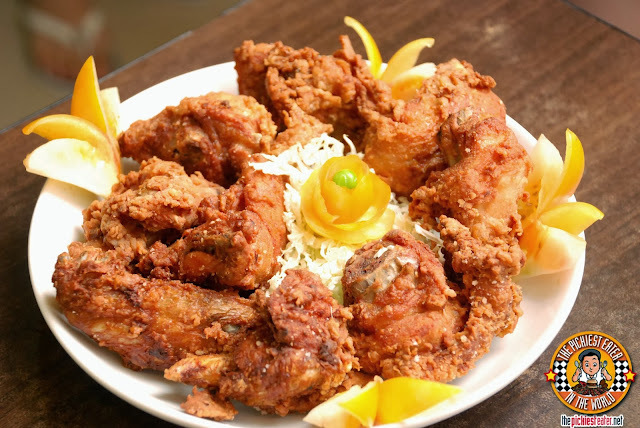 It's about enjoying a wonderful meal at a ridiculously reasonable price. A great way to start the meal is to warm the tummy with some delicious soup! 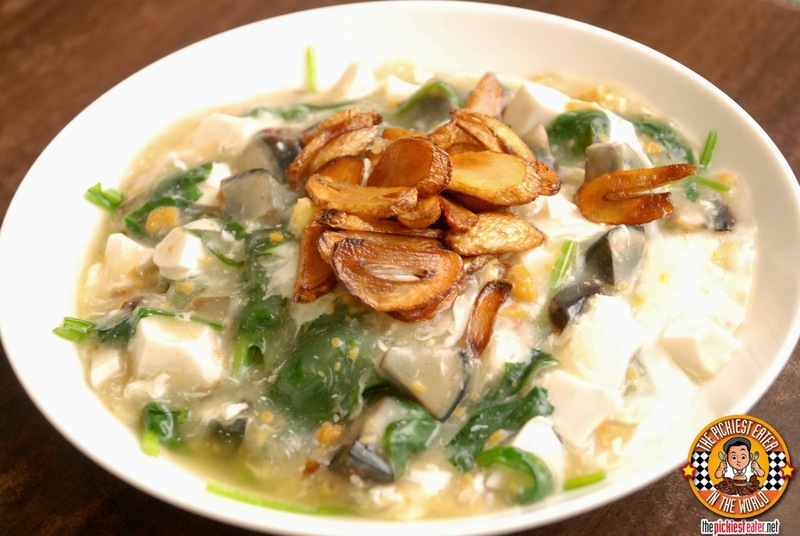 And their Shifu Congee (P145) won't disappoint! It's seasoned well, just the way I like it. 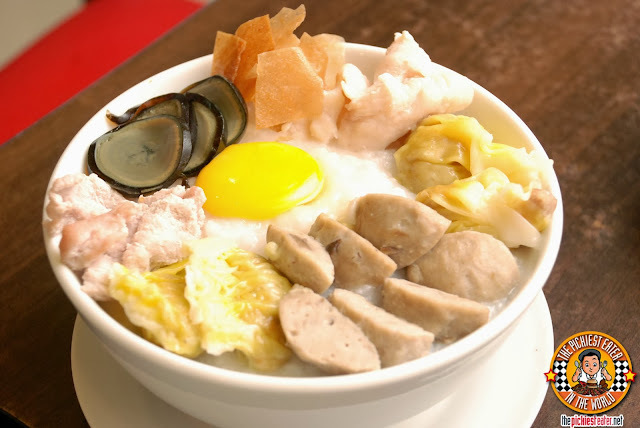 In fact, at first sight I thought it might lack flavor because the congee is very white in color. I'm used to my patis (fish sauce) adding a bit more yellow to the soup hahaha. But I was wrong. It was very flavorful. It's already a meal on its own. I mean look at that amount of meat topping! With 2 kinds of eggs too! 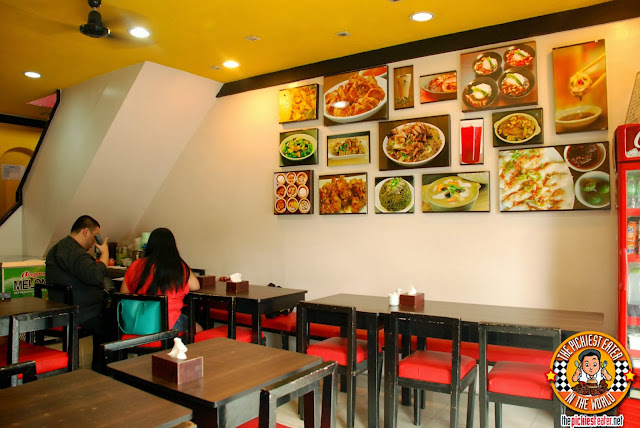 Their Sate Fish Fillet Soup (P215) is also a good soup to start with. Its quite creamy with a lot of flavors. Its not until you've had a couple more slurps when you start realizing that there's actually a small amount of heat which makes it even more addicting! 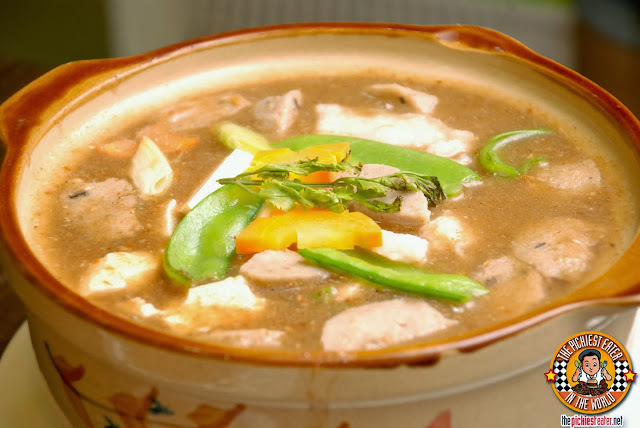 This other creamy soup-like dish is called the Three Eggs Polunchay (P205). It's not actually soup.It's more of a vegetable dish that has lots of chopped century egg, salted egg, creamy auce, and chinese spinach then topped with roasted garlic. You can only imagine how tasty this is. If you don't eat spinach I'm sure this will be an exception! Moving on to some other appetizers! 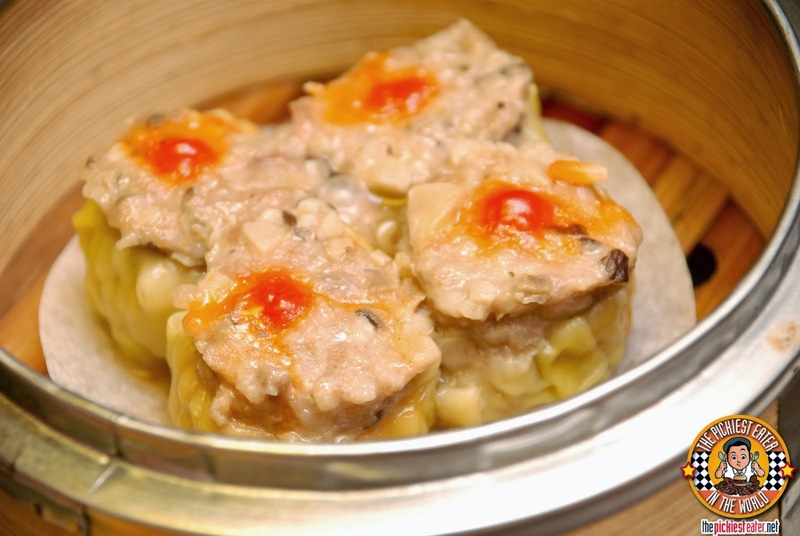 Shifu Master's Pork and Shrimp Siomai (P65) is a real winner. 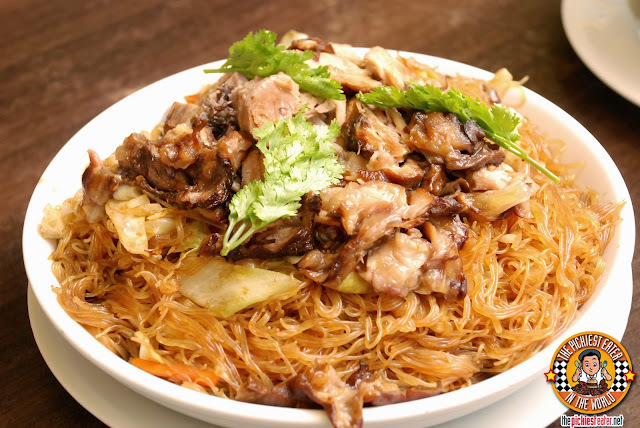 Not just because it tastes great but also because it's packed with meat and it's only P65! One bite and you can tell that they propably stuffed in as many meat as they can in there. So filling! 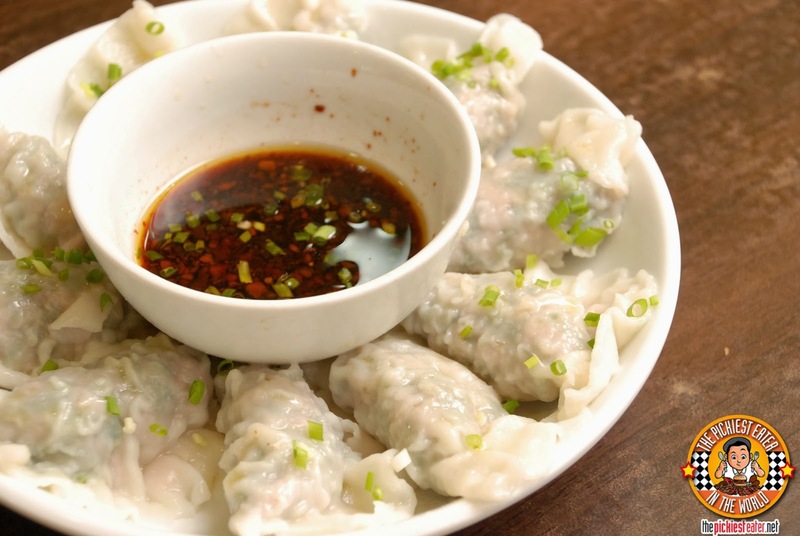 Next is the Kutchay Dumplings (P180 for 10 pcs) is a fresh dumpling of garlic chives and ground pork wrapped in a fresh dumpling wrapper. Dip it in the chili soy sauce and BOOM! A great combination of freshness and just the right amount of heat. 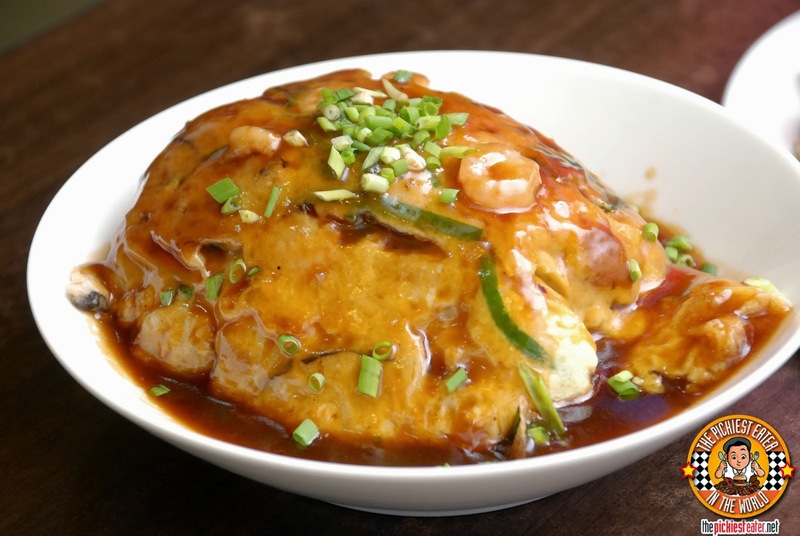 The Shrimp Fuyong (P225) is like a very fancy omelette with shrimps bathed in a creamy soy type of sauce! Yes this tastes as good as it looks! That's a huge folded omelette right there! Okay let's move on to the heavier stuff! 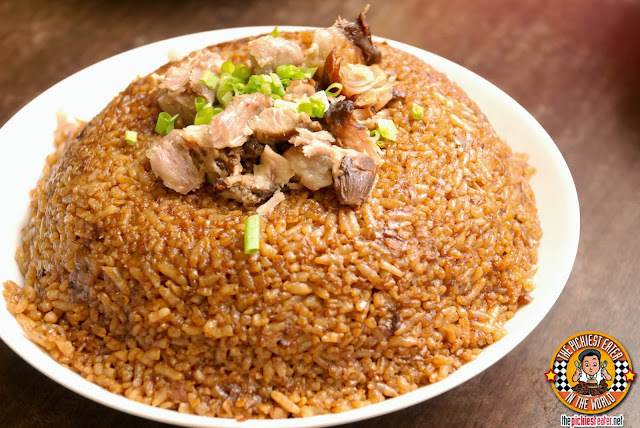 This on the other hand is the Pata Rice (P155). I can eat this alone. No other viands needed and I'll be happy for the rest of my life! The rice alone is already very tasty. And you know how much I love rice. This is really something to go back for! Actually I take it back. They served us a lot more viands that afternoon and all really went well with this genius rice invention! 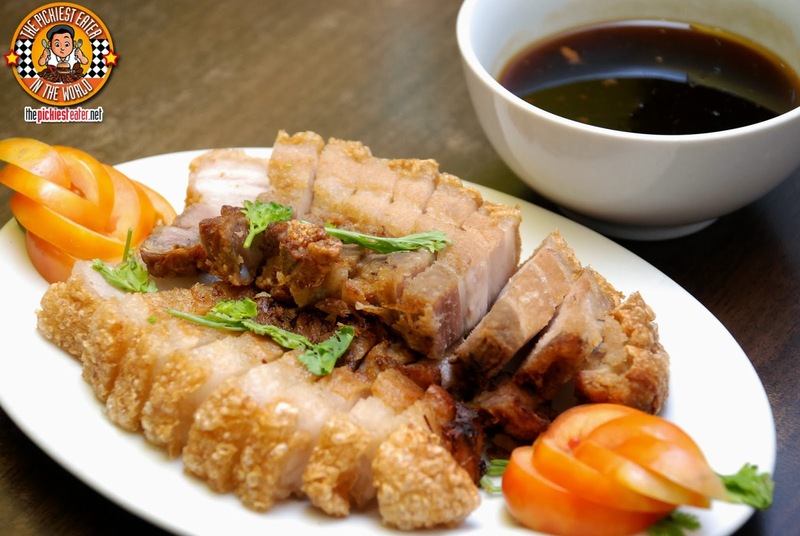 I mean how could you not pair the Pata Rice with this beautiful Lechon Macau?!? The awesome thing about this is even if we didn't eat it immediately because we were taking lots of photos, the skin was still in it's most crispy and salty state, and the meat in its softest! Love! I didn't even have to dip it into the sauce! The Chicken Chops (P145) was also one of my favorites. Why? You guessed it! It had that right saltiness that I love with just a hint of sweetness. The meat was very soft, and the breading, very crunchy! 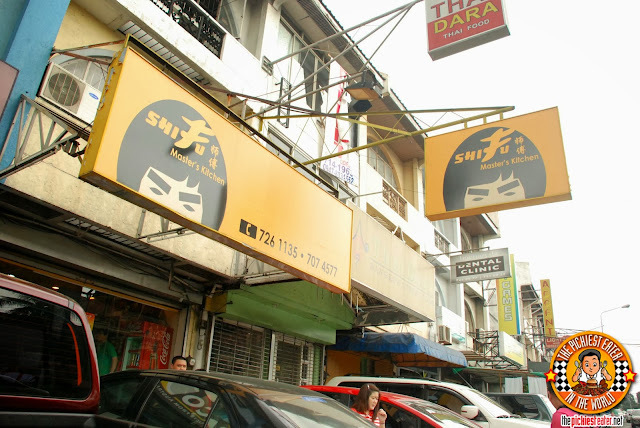 And last but definitely not the least is their Shifu Milk Tea! I swear I had like 2 huge glasses of this. I could have drank more but I got a bit shy. 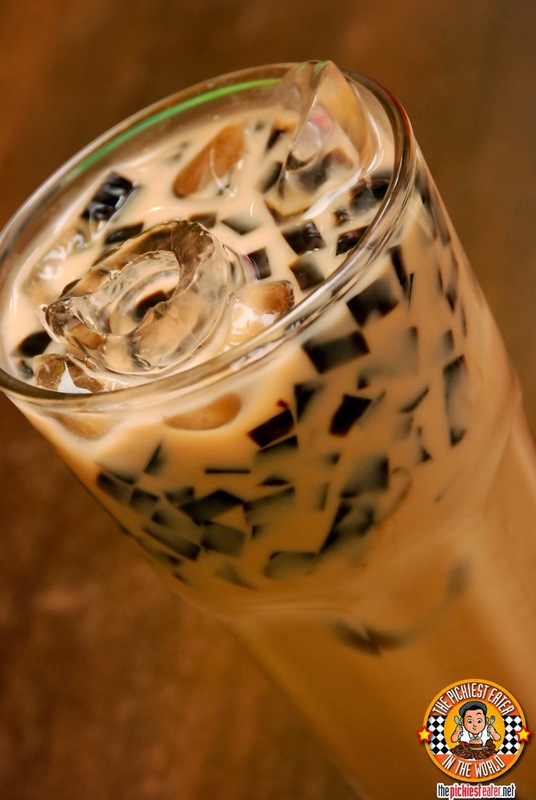 You would drink a lot of this too especially if you knew that it's BOTTOMLESS for only P110! Amazing! Watch out milk tea places! 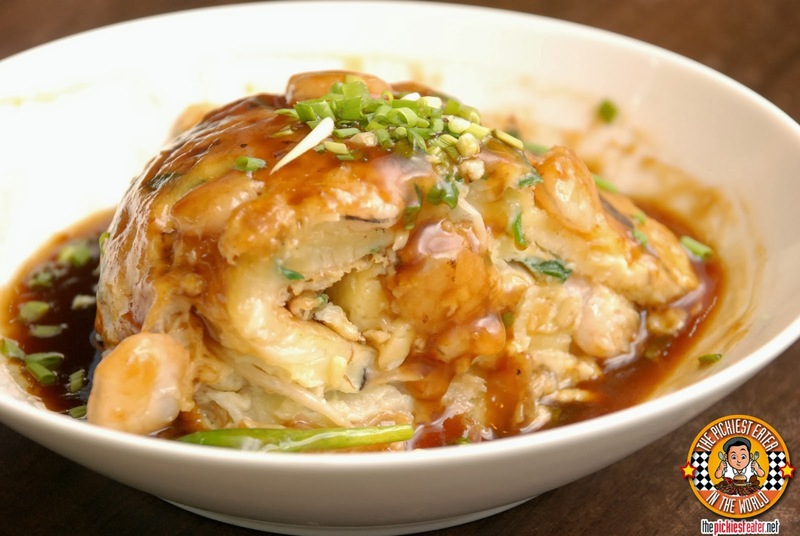 I promise you guys that Shifu Master's Kitchen is definitely a must-try restaurant for really good comfort Chinese food that has excellent value for money!